A recent report discusses the future of community-based human services. Here is how accreditation plays into it. In late January, a call-to-action report was commissioned by the Alliance for Strong Families and Communities (Alliance) and the American Public Human Services Association (APHSA) called A National Imperative: Joining Forces to Strengthen Human Services in America. It’s worth a read. Telling the story of a fictional American county, the 64-page report offers a comprehensive look at the factors that affect a strong ecosystem of community-based organizations (CBOs). It covers financial challenges, operational strength, outcomes management, risk management, funder requirements, social determinants of health, societal costs, and much more. Financial management policies and practices. The report does not mention third-party accreditation, but maybe it should have. The first four initiatives are directly supported by CARF standards, meaning, if you’re a CBO applying the standards for accreditation, you’re likely strengthening the overall ecosystem. Here are the standards and other CARF resources that can offer guidance to your organization on these specific topics. It is critical that organizations in behavioral health now make a concerted effort to define measures of performance that are standard and comparable to the rest of the health system so that they can articulate their value externally. Input from Persons Served and Other Stakeholders—identifying outcomes that are relevant and important to a CBO’s stakeholders. Performance Measurement and Management—identifying, collecting, and analyzing reliable outcomes data. Performance Improvement—using outcomes data to improve business practices and service delivery. A publication to help you develop and implement a performance management system and use the information obtained to continuously improve service delivery and enhance outcomes of persons served. A workbook designed to walk you through a process of designing a performance management system. It addresses the quality side of the equation. Survey tools to gather Consumer Experience and Employee Climate data. Similar to the Transforming Outcomes institute, this three-day training will take the mystery out of defining, measuring, and reporting the performance of your programs and services. This guide provides useful information for developing board and leadership support for performance management and practical information for management and line staff engaged in performance measurement and improvement activities. It’s making sure that not only are we taking care of the patient at this particular moment, but our business practices are in place and solid so that we’ll be available to take care of those patients in the future. Strategic Planning—assessing the environment, use of technology, leadership and governance. Risk Management—succession planning, emergency preparedness, and communications. Workforce Development and Management—hiring for outcomes, competency-based training, and managing performance to objectives. Technology—technology & system planning and use for information management, performance improvement, service delivery, and training. A whitepaper produced by John Franklin, Managing Director/Group Head at BB&T Capital Markets Healthcare Finance Group. John is a member of CARF’s Financial Advisory Panel. A blog article featuring Dave Wilber, a long-time CARF surveyor, and his perspective on CARF’s business practice standards. Newsletters feature mini case studies of programs that have developed innovative practices. Integration of services, sharing of healthcare records and outcomes data, and closer relationships among providers contribute to keeping people out of inpatient settings and in their communities. The core program standards, which are unique to each manual, cover working with community resources, education systems, correctional facilities, and more. They also cover using collaborative partnerships to supplement services or to address gaps. NCQA and URAC have recognized CARF’s network standards as satisfying the credentialing process for a network. A blog article discussing the challenges and opportunities related to the trend of service delivery models moving toward larger systems and networks. A blog article featuring interviews with three former CARF surveyors who are now CARF staff members. They shared some interesting information on how surveyors are collaborative and share knowledge throughout industries. An organization is better able to define success with proactive long-term financial planning measures. As the future financial position of an organization is impacted by ever changing marketplace factors such as coding, payment, reimbursement, and costs, the strategic plan might include information reflecting long-term financial planning to support the goals and priorities identified. Financial Planning and Management—fiscally responsible practices; budgeting for outcomes; analyzing and reporting results; and identifying trends, challenges, and opportunities. This publication provides analyzed and standardized financial information from the audited financial statements of multiple CARF-accredited continuing care retirement communities. It is a collaboration of Ziegler, Baker Tilly, and CARF. A management tool for CCRCs, used to automatically calculate financial ratios. Just enter financial data from your community's annual audited and projected financial statements. An article by Sue Matthiesen, CARF’s managing director of aging services, published in Seniors Housing Business magazine. This guide provides an overview of some key concepts related to financial performance of CCRCs and some specific issues for consumers to contemplate when considering a move to a CCRC. Sophisticated Systems for Business Success. “Sophisticated systems” is a term coined by John Franklin, Managing Director/Group Head at BB&T Capital Markets Healthcare Finance Group. The human service industry struggles with a changing funder environment and lack of consensus on what outcomes measures should look like. Sophisticated systems are the methods and processes an organization uses to create and measure outcomes and position itself for the future. 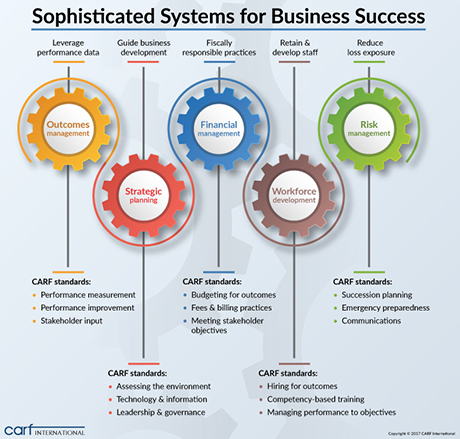 CARF’s ASPIRE to Excellence quality framework helps organizations build sophisticated systems, and is adaptable to the human service industry’s many unique service offerings.